Unibrake is the only A-frame towing system in Europe that gives you the combination of unique features which finally provides all the answers to all your questions and concerns regarding A-frame towing. Utilises the towed vehicle’s own power assisted brakes. Braking intensity can be adjusted by driver for different weight variations. Multi-function control unit in motorhome. Unique in performance control and safety. Compliance with current and forthcoming legislation. For the summary of UNIQUE features, please refer to the WHY UNIBRAKE” section. With Unibrake you tow with total confidence and safety, through brake adjustment you can create the outfit to behave as one unit. Unibrake gives you feedback while towing, and a unique breakaway system, as required by law. 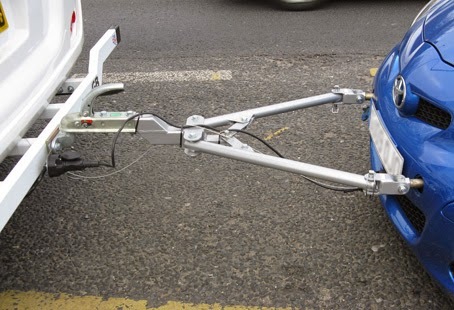 Another feature of our towing A-frames is the ability to change the brake intensity in the towed vehicle depending on motorhome to car weight ratio. With 9 different settings, our Servo towing systems can be adjusted to ensure optimum performance.